In Brazil, alkaline intrusions are source rocks for several commodities (bauxite, phosphate, niobium and barite, to mention a few), including mineral water. 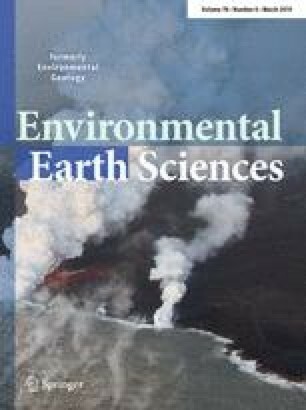 The present study aims to understand by means of chemical and stable isotope analyses, the residence time, circulation and hydrochemical facies of the groundwater systems from the alkaline–carbonatitic complex of Barreiro (State of Minas Gerais, Brazil). This Mesozoic alkaline complex is located in the Brazilian tropical region characterized by weathered soils and fractured rocks, which play an important role in the groundwater dynamics. To assess this influence, groundwater samples from 12 points and water samples from 3 artificial lakes were collected for the determination of chemical element and natural isotope (18O, deuterium and 13C) concentrations and 14C and tritium dating. Two main groundwater categories were revealed: (a) a local, acidic and sub-modern groundwater system developed in thick, poorly mineralized weathered soil from the inner part of ACCB, and (b) a basic, hypothermal, ca. 40-ky-old fractured aquifer developed in mineralized fenitized quartzites. The younger and shallower groundwater circulation is controlled by the present intrusion relief and is prone to environmental impacts. The older, hypothermal groundwater system indicates existing geothermal residual heat provided by the Mesozoic alkaline intrusion.